A chaotic distribution is the most common way of living on a barren land with little topographic marker points. Huts and shelters are placed in a random way, because there is no specific marker in the field and the people do not have the urge (or necessity) to build their houses in some sort of pattern. An element of temporality is often involved when houses or dwellings are located in such a way. 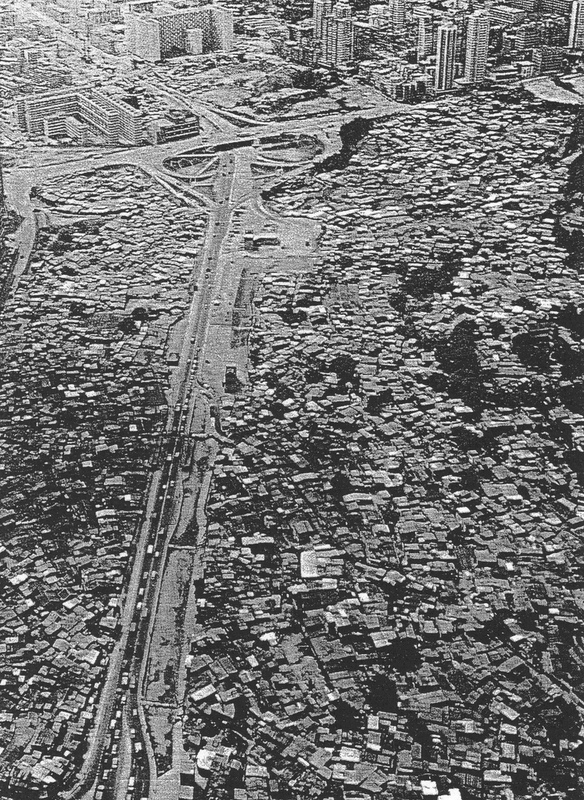 The famous shantytowns, which are next to many big cities in Third World countries (Africa, South America and Asia) are good examples of chaotic conglomerates (fig. 509). They were initially built as temporary shelter, with haphazard gathered materials, but becoming more permanent when the economic situation does not change for the better. Fig. 509 – This shantytown on the outskirts of Hong Kong was created east of Wong Tai Sin, north of Kowloon, and dated from 1980. Chaotic, unstructured building has its own place within the quadralectic spectrum. It fits into the characteristics of the First Quadrant, where a higher order is not yet defined, because there are no boundaries to establish any distinction. The area is, in a psychological sense, in constant flux and/or in an eternal motion. No specific visibility other than ‘chaos’ can be distinguished. The form of this unidentifiable area in the (quadralectic) communication is called a unity, since its includes all thinkable and unthinkable situations. Chaos is less common than one would expect in the building of modern cities. Apparently, there are many reasons for people not to build in a chaotic way. Laugiers wrote in his ‘Essai’ – in the eighteenth century (1755) – that ‘most towns are built haphazardly, following no system or design, and the resulting disorder is nowhere more shocking than in Paris’ (HERMANN, 1962; p 137). He was talking about that same state of semi-permanence living in Paris, which still occurs in the large cities of the development countries of today. It was clear, in his view, that ‘a well-ordered town should have broad avenues, planted with double or treble rows of trees, should lead to the gates, all of which should be formed, not by miserable barrières like those of Paris, but by magnificent triumphal arches’. (Essai, p. 256). Behind the entrance gate, he foresaw a big square from which three streets should lead, fan-like, into the town. The search for order is an activity, which takes place when parts are established and has its roots in the dynamic Second and/or Fourth Quadrant. 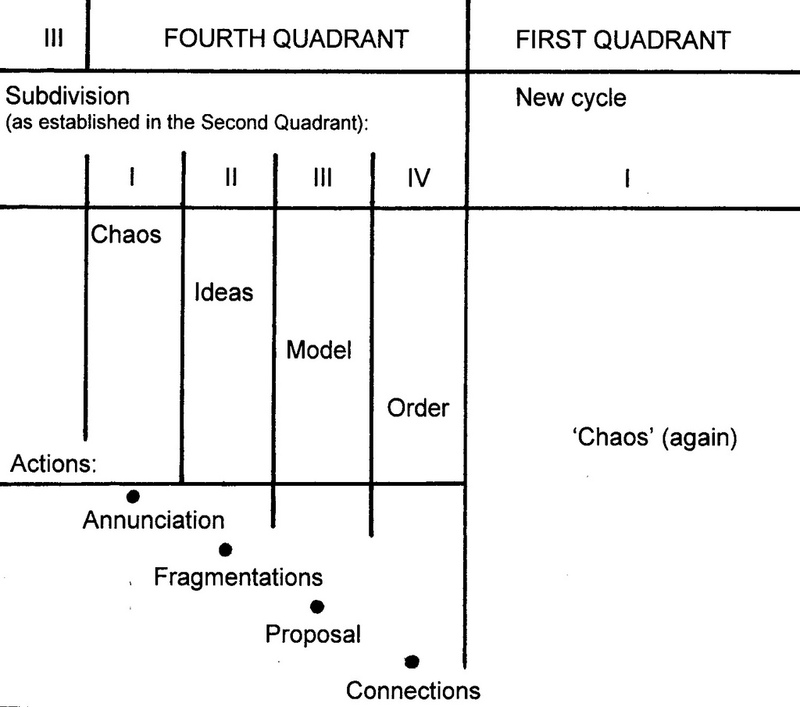 These fragmented ideas will, in their final stage, end up in a new chaos (of a new First Quadrant) (fig. 510). Fig. 510 – This proposed scheme gives the main psychological themes in the Fourth Quadrant. The subdivision (of the Fourth Quadrant) follows the same characteristics, which were earlier established in the Second Quadrant and will end with a new cycle. 1. How to see manifestations of global influences on local environ-ment? 2. How to model them? 4. How to implement these scenarios? The first question could be tackled by an ‘annunciation’ (proclamation), which is framed by cultural preconceptions and existing forms. The models should map out incisions or lines of connection, because ‘by making an object, you question everything else’. Architecture should appear as an artificial continuation of the project of fragmentation and connection. Raoul Bunschoten and his associates gave their project for the Center of Berlin (Germany, 1988) the name ‘Apeiron or Chaos embodied’. The term apeiron (the boundless) pointed to Anaximander (c. 611 – 546 BC), the Ionian philosopher, who believed that infinity holds the key to understanding. Steven M. ROSEN (2004) wrote a brilliant book on this subject and underlines the need to incorporate the notion of apeiron in our thinking (again). He points to a science of experiential reflection that questions the limits of the conceptual. ‘Chaos embodied’ is the teeming of the multitude, as it exists in fragmentation and shaping it into a new proposal.